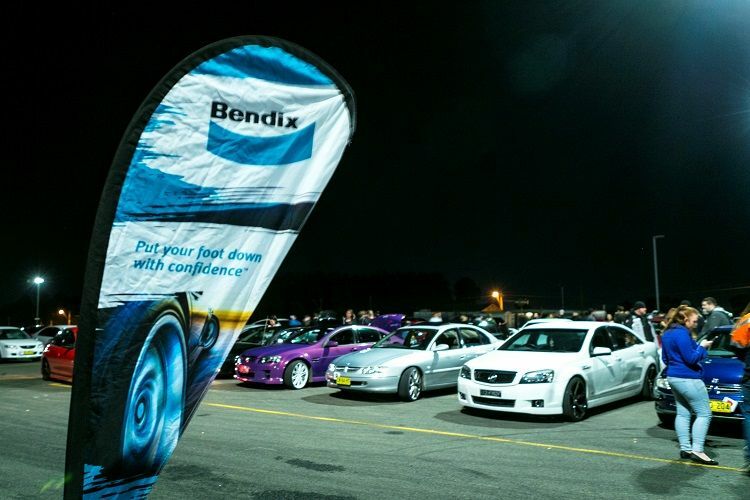 The cold obviously never bothered car enthusiasts, as June’s EOMM was once again flooded with cars at Sydney Dragway! 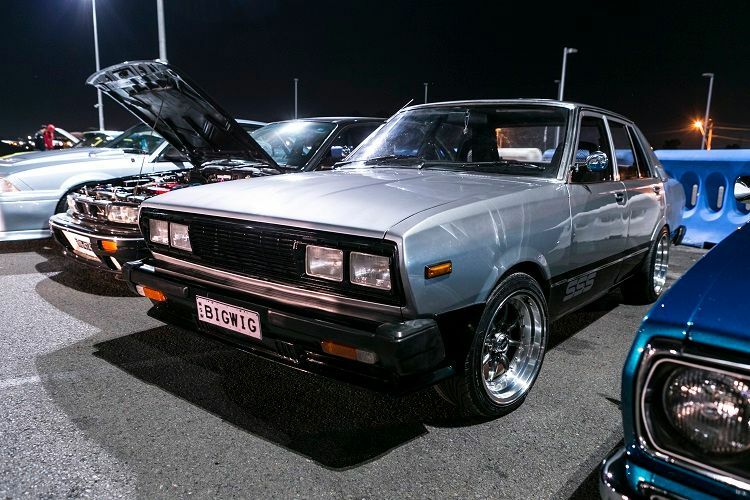 A wild and varied mix were on show this month, from feisty little hatchbacks to low-riding Caddys, all the way to show cars with massive sound systems, and little racy coupes setting fast times at the track! “A Nissan what?” you may ask. The Stanza was never a popular car worldwide, slotting in between the Sunny and 200B. It was assembled locally by Nissan Australia from 1979 to 1982, and did well amongst local buyers. Andrew’s Stanza SSS was immaculately repainted and restored by the previous owner, and once he took possession of it, promptly went to the drags and ran a 12.9sec quarter mile with a standard SR20DET. Now it’s back meaner than before, with a forged motor under the bonnet, sucking air through a GTX3076 turbo. 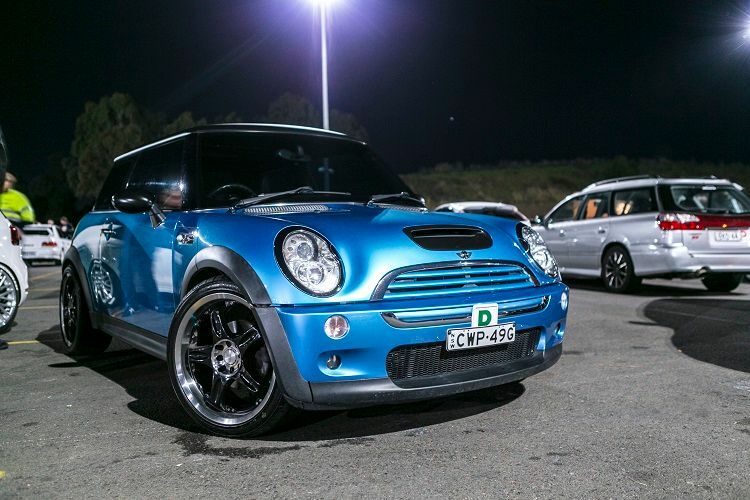 Andrew reckons it’s on 270kw on the run in tune, and after it’s all done, would love to get low 11s on street radials. 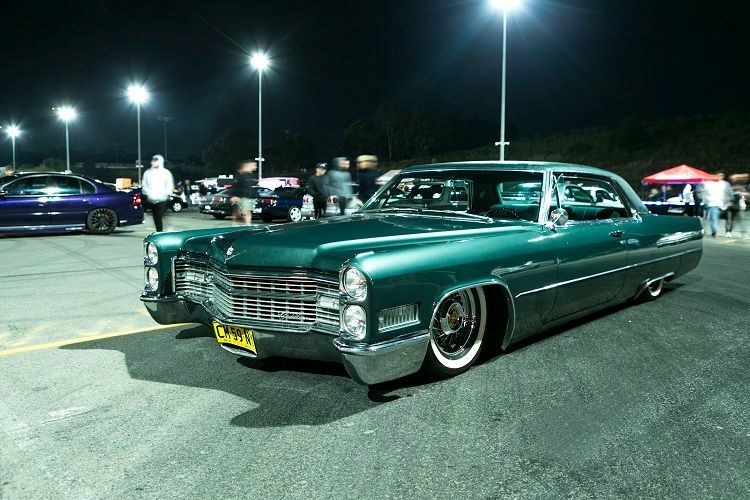 Classic American luxury coupes are a thing in the Australian car culture, and it’s no wonder; all you need to do is to take a beautifully restored Caddy, put it on bags, and slam it! Chris’ DeVille was restored in Nevada, before being imported here and sold to Chris. Arguably the best looking version of the old school Caddys, the 1966 coupe pictured here featured a vinyl roof and paintjob in Inverness Green, period correct wire wheels with white walls, and of course, air bags for that gangster low look. It’s a Toyota Corolla, but before you start yawning, it’s a mint one that you can’t go on Gumsales.com.au and buy for $500 with 6 months rego. The rare, two door hatchback was only available in Japan, and this one here was a personal import. With only 149,000kms on the clock, and a full, up to date Japanese logbook from Nagano, it’s certainly a collector’s item. 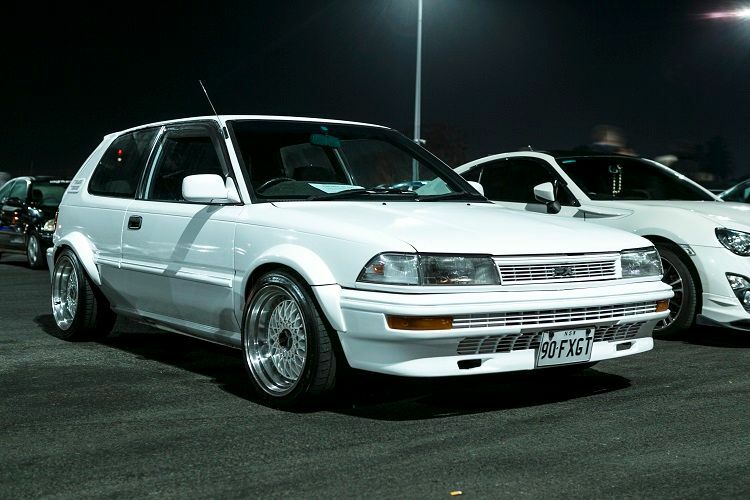 Elliot’s own modifications include a Toaster White respray, custom DIY flares, and 9.5in wide BBS style wheels. Inside it has a mint interior other than some wear from Japanese tweed, and a bit of ciggie burn on the rear seat from a JDM dart. It really has character, something that can’t be said for most of today’s Toyotas. 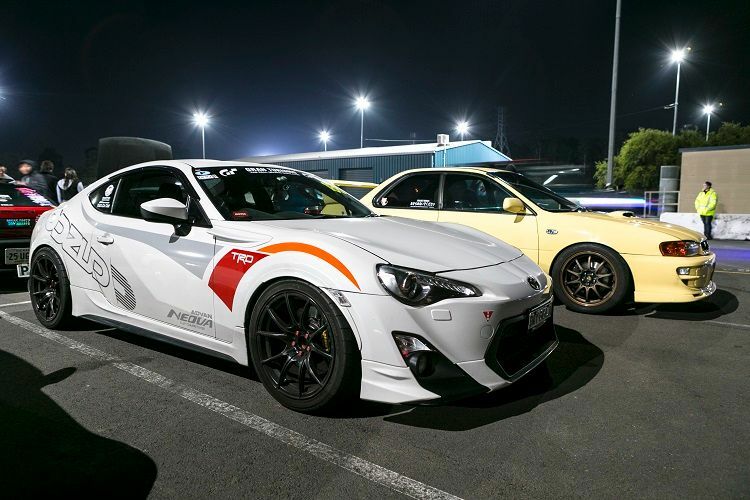 Steven’s list of modifications look like a JDM fan’s Dear Santa letter; from the TRD and Varis body kit, right down to the massive AP Racing big brake calipers on the front. Under the bonnet, the parts are from Japan’s most well-known tuners; Cusco, Revolution, HPI, GReddy, HKS, Blitz, etc. The wide Wedsport rims are running Yokohama AD08Rs, made to run very quick lap times on the track. Despite being an automatic, Steven has lapped the Wakefield track in the 1:10s, a very respectable time for any circuit racer. We walked past this hulking monster and had to double back after spotting an out-of-place straight six petrol engine inside this 4WD. 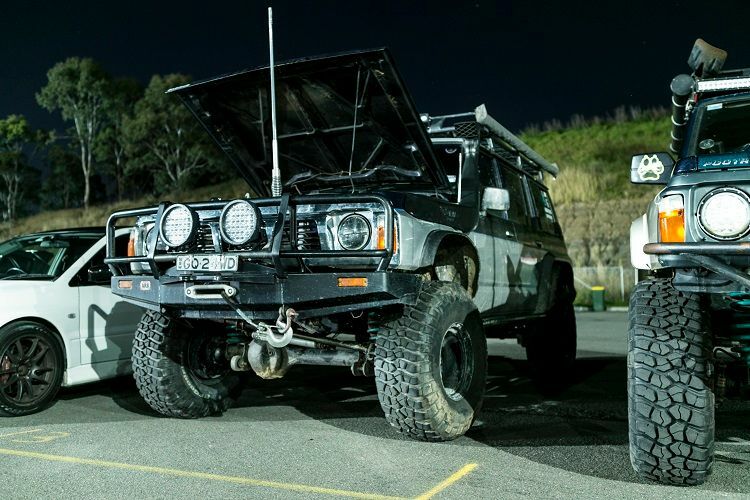 Jayden had chucked out standard issue 2.4L diesel engine, making way for the updated 4.2L turbocharged petrol straight six from the more modern Patrols. A Garrett 3540 hangs off the side of it, and Jayden says it makes 300hp, but with 800Nm of torque on the fat 35in tyres. A 5in lift kit with external reservoirs are needed for serious off-roading Jayden often does, and those knobbly BFG KM2 tyres provide serious grip in all sorts of conditions. Best thing is, it’s all built in the backyard with his mates! 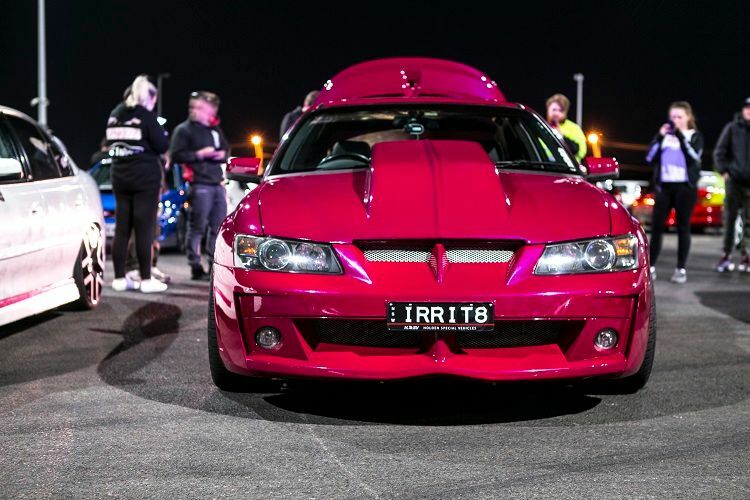 Laura’s HSV Clubsport is one of a kind, with a custom body kit and pink paintjob, it definitely stood out at EOMM. The LS1 has been given a tickle with a cam, full exhaust system and an OTR intake, along with an accompanying tune. Looks and speed isn’t enough for Laura though; she’s serious about the Clubsport, with plans to enter it in this year’s prestigious MotorEx car show. Pop the boot and doors, then stand way back, it is jam packed with the best gear from Pioneer, all arranged in a simple but pleasing way. Laura tells us it’s not complete yet, with air bags on the to-do list. Can’t wait to see this lay rail on the ground! The Crown Athlete V isn’t a car you see every day. Nathan purchased it in Japan via an import broker, and registered it just last month. 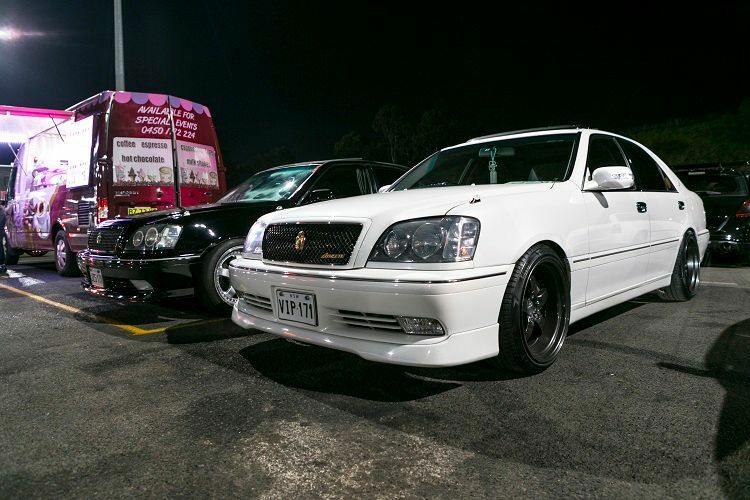 Powered by the renowned 1JZ-GTE, the Crown is all about cruising the roads in aristocratic luxury and style. The imposing presence is heightened by the lowered stance and wider 7Twenty Style49 wheels. Inside the all leather interior has been garnished with the choiciest Junction Produce curtains and neck rests, Garson DAD dash mats and passenger table. Even the OEM TV has been tweaked to mirror Nathan’s iPhone. Airbags, engine work and proper Leon Hardritt wheels will soon join the mod list. Despite the updated, modern retro shape, the new Mini still retains all the fun character of the original; go kart like handling and the ability to put a smile on your face. The updated supercharged engine in Lachlan’s Cooper S means push is upgraded to shove. The enhanced Cooper S makes quite a bit pony more than from factory, thanks to a 17PSI pulley, aftermarket intercooler, custom hurricane exhaust, and tuned to pump 220whp. The 18x7.5in wheels don’t look lost in the wheel arches, and are wide enough to provide awesome grip around corners. Nice grouping but NO Fords?